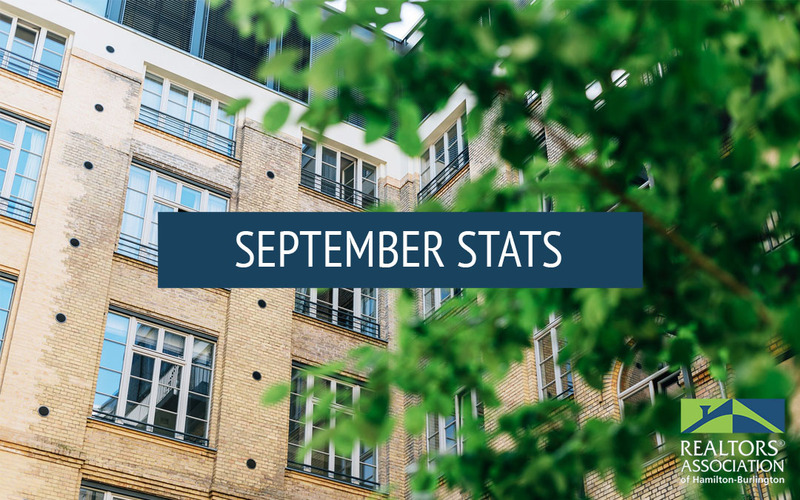 The REALTORS® Association of Hamilton-Burlington (RAHB) reported 948 sales of residential properties located within the RAHB market area were processed through the Multiple Listing Service® (MLS®) System in September, 2018.This is a 4.6 per cent increase over the same month last year. Year to date, sales are 18.8 per cent lower than last year at this same time. The Sales to New Listings Ratio, which can point to whether a market is in favour of sellers (above 60 per cent) or buyers (below 40 per cent) was 50.1 per cent. This indicates the overall residential market for the RAHB area is in a balanced position (between 40 to 60 per cent). Last year for September, the ratio was at 43.7 per cent – still considered balanced but trending towards a buyers’ market. The number of sales for single family properties within the entire RAHB market fell compared to last year, while the average sale price remained virtually the same. Townhouse sales activity was down from 2017, and the average townhouse sale price was down from last year, as well. Apartment-style property sales were down from last year; however, average sale price was up compared to September 2017. 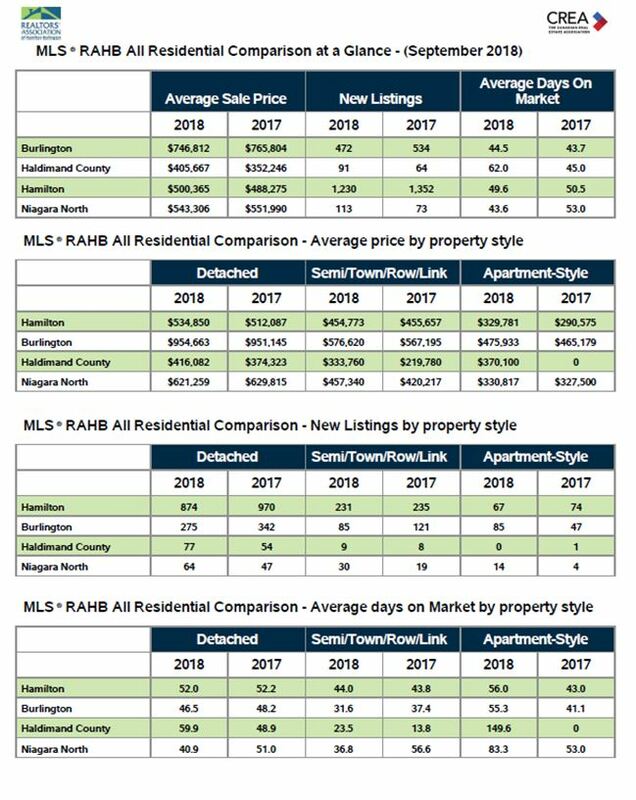 When the major areas within RAHB”s market are isolated, Hamilton and Haldimand County both saw an increase in overall average sale price, while Burlington and Niagara North experienced a decrease in overall average price. Over the last month, RAHB implemented the Canadian Real Estate Association’s (CREA’s) MLS® Home Price Index (HPI) for RAHB REALTORS® to use and benefit their clients. The MLS® HPI is based on MLS® listing content and takes into account various details of a property, such as number of bedrooms, age of the home, lot size, number of fireplaces, number of bathrooms, type of foundation, and other relevant attributes. More information on CREA’s HPI can be found at www.crea.ca/housing-market-stats/mls-home-price-index/. “Combined with the knowledge, experience and skills of a RAHB REALTOR®, the MLS® HPI provides an even better understanding of trends and how they can affect the market value of a home,” adds O’Neill. The MLS® HPI Composite Benchmark can be classified as the “typical” residential property within a given area. For example, below is the composite benchmark price compared to the overall average residential price for the entire RAHB market over the past decade. Specific neighbourhoods within the RAHB area experience results that differ from the average of the entire RAHB market area. Because neighbourhoods vary, determining the right price when buying or selling a property can be challenging. Local REALTORS® have the experience and tools to help buyers and sellers make those big decisions, so please consult with one. *Average sale price is based on the total dollar volume of all properties sold through the RAHB MLS® System. Average sale price can be useful in establishing long-term trends, but should not be used as an indicator that specific properties have increased or decreased in value. Talk to your local REALTOR®.